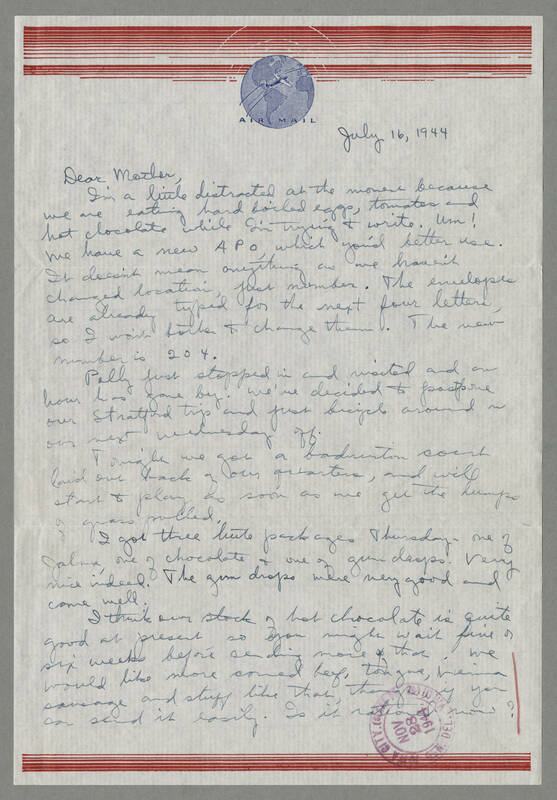 July 16, 1944 Dear Mother, I'm a little distracted at the moment because we are eating hard boiled eggs, tomatoes and hot chocolate while I'm trying to write. Um! We have a new APO, which you'd better use. It doesn't mean anything as we haven't changed location, just number. The envelopes are already typed for the next four letters, so I won't bother to change them. The new number is 204. Polly just stopped in and visited and an hour has gone by. We've decided to postpone our Stratford trip and just bicycle around on our next Wednesday off. Tonight we got a badminton court laid out back of our quarters, and will start to play as soon as we get the lumps of grass pulled. I got three little packages Thursday, one of Jalma, one of chocolate & one of gum drops. Very nice indeed. The gum drops were very good and came well. I think our stock of hot chocolate is quite good at present so you might wait five or six weeks before sending more of that. We would like more corned beef, tongue, Vienna sausage and stuff like that, though, if you can send it easily. Is it rationed now?